Gregory Hancock Dance Theatre is excited to perform at the Indy Fringe Festival for the first time. 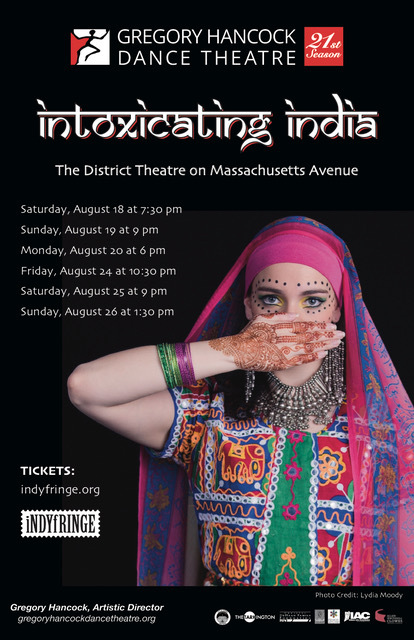 Bringing a sampling of their diverse repertoire, GHDT will mesmerize audiences with Intoxicating India, a theatrical dance production inspired by the history, art and culture of India. Choreographed and costumed in its entirety by Gregory Hancock, Founder and Artistic Director of GHDT, this 50-minute performance will provide an educational and entertaining experience for all ages. The Sari, a poignant piece depicting the desire to remain steeped in tradition while navigating the modern world, will immerse the audience in beauty through movement, music, and costume. A solo work, Shiva’s Tandava, is inspired by the most powerful god of the Hindu pantheon, Lord Shiva. As Nataraj, Lord Shiva dances tandava, the divine art form symbolizing the cosmic cycles of creation and destruction, birth, and death. Kalbelia, with vibrant costumes and rigorous movement is inspired by the Kalbelia Gypsies of Rajasthan, whose dances sometimes replicate the movements of snakes. Lagaan is one of the company’s signature works from the Indian repertoire and will round out this diverse performance. An abstract dance, Lagaan highlights the athleticism and beauty of the dancers, and is set to joyous and infectious music.